Indulge me as I wax nostalgic. Yesterday was the first day of school for Chris. Like all American parents obsessed with capturing every moment of their child’s life I immortalized this event with a photo. At first glance the photo is remarkably unremarkable. In it a very tall nine year old boy in a generic school uniform poses for the camera with his Papa in front of a red door and brick backdrop. The boy has glasses. An obligatory smile is plastered across his face. His hair matches the color of his shirt. He carries a messenger bag. Now swipe back two years to another first day of school – the first first day of school 725 days before this third first day of school – to a photo of the same boy. In this immortalization the boy is still in a generic school uniform, still posing for the camera with his Papa, still in front of a red door and brick backdrop. The boy still has glasses. An obligatory smile still plastered across his face. The photos are not identical. There are superficial differences. The boy from the first first day is seven years old. He is much smaller. His hair does not match the color of his shirt. He carries a cartoon lunchbox. But if you could go inside each photo and talk to the boy, then at seven and now at nine, the differences would become less superficial and more significant. Seven hundred and twenty-five days ago Chris clung to me on that first first day of school. He wanted nothing more than to stay with me as he had stayed with me every day for the preceding eight weeks since that day he first came to live with us. Two years ago on that first first morning I abandoned him. Uncertain and afraid I watched as he tearfully walked his death march into the second grade. Yesterday my son declared that this was going to be a good year. He announced that he would be the most popular boy in school. There was no death march on this third first day, only confidence as he walked his way smiling into the fourth grade. Which One of You is the Mother? 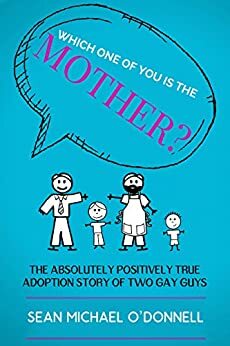 is available on Amazon: Buy Which One of You is the Mother? here. No seriously, buy it now. It’s only $4.99 for the Kindle version and $9.99 for the paperback edition. A venti Starbucks Frappuccino costs more and unlike that Frappuccino this book won’t make you fat(ter).